THE relationship between Dynamos and Christian Ntouba has reached an irreconcilable point, and the Cameroonian now wants to terminate his contract with the Harare giants and return home. Ahead of the blockbuster clash between DeMbare and Highlanders at the National Sports Stadium this afternoon, the Ntouba soap opera has continued to hog the limelight as the Harare giants struggle to take care of the welfare of one of their most prized assets. Dynamos and Ntouba are at loggerheads over a $16 000 outstanding amount emanating from unpaid signing on fees, salaries and allowances. The forward, who still has seven months left in his contract, is unhappy with the way the club has handled his financial situation, as they continue to dither on clearing the dues and wants to be cut loose from the relationship. His manager Gilbert Sengwe yesterday said his client has been frustrated by the lack of commitment from the Dynamos leadership and is ready to lose everything that he is owed in order to get a way out. "He (Christian) is just fed up with the whole saga," said Sengwe. "He feels he is no longer wanted at the club. I have tried to talk to him, but he says the environment is no longer conducive. He has been training with the squad until yesterday (Saturday), but that should change next week." Ntouba has been training with Dynamos, but missed the team's opening three matches of the season in protest over the outstanding fees. His work permit has since expired, which makes him ineligible to work in the country. 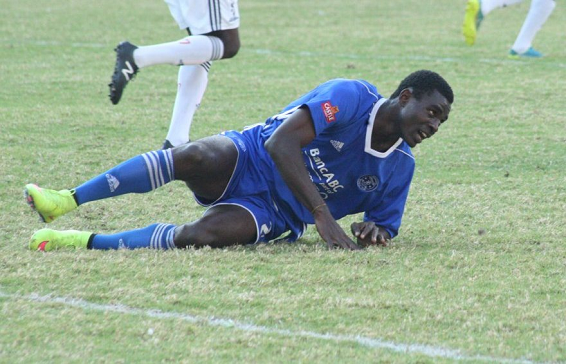 "His work permit expired on Saturday, and Dynamos has not done anything to correct that, one major indication that they are no longer interested in his services. He is frustrated, and angry. He wants to go back to Cameroon. "As his manager I can't do anything anymore because he has actually told me that they can keep the money. He doesn't want the money anymore. He is asking to be cleared so that he can go back to his country. He does not see any reason to stay any longer here because he is not playing, and not paid his monies." No comment could be obtained from the Dynamos executive as chairman Keni Mubaiwa and secretary-general Webster Marechera were not reachable. Dynamos last week claimed that they had deposited the money into Ntouba's account, but Sengwe said they had only deposited $3 000 into a "wrong account." "Dynamos refused to facilitate him to access foreign currency since he is a foreigner. He wants forex, so he can send it back to his family. Ntouba then opened a new account with a different bank so that he could be able to access the money in foreign currency. "He notified the club in writing about the change in bank accounts. But Dynamos went on to deposit money into the old account, which he cannot even access because he is now using a new passport. "Dynamos say he should transfer the money to his new account, but he cannot do that because of the change in his particulars." These developments would come as a big blow to underfire coach Lloyd Mutasa who was hoping to have his top marksman for the season, starting with a must-win match against old foes Highlanders at Rufaro Stadium this afternoon. Mutasa has picked just one point from a possible nine in the first three games of this campaign, results that have not gone done well with the club's supporters. Failure to pick maximum points again today, and alarm bells will ring even louder. Highlanders are arriving in Harare high in spirits after a good start to their season, where they are undefeated in their opening three matches, with two wins and a draw.